Our primary task is to prevent loss of life and property from fire. The best way to do that is to prevent the fire from starting in the first place. To that end, the department helps conduct inspections and helps enforce fire codes and city ordinances concerning fire prevention. Each year the department distributes free calendars to the residents and businesses of the city. 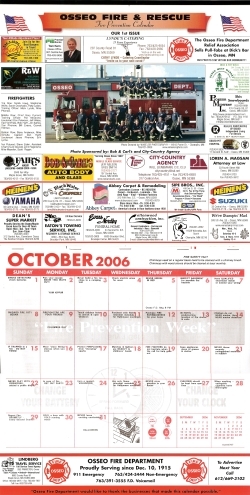 These calendars contain many fire prevention tips intended to keep residents mindful of possible dangers, fire prevention techniques, and best procedures in the event of a fire. These calendars also contain coupons for local businesses. They are paid for by the local advertising printed on them. The proceeds from the advertising help defray the department's operating costs and to fund community projects. In order to prevent injury and property damage, the city of Osseo has ordinances in place concerning recreational fires. Residents must obtain a permit annually in order to have recreational fires. The permit is free of charge and can be obtained at City Hall. "The burning of materials other than rubbish where clean fuel being burned is not contained in an incinerator, with a total fuel area of three (3) feet or less in diameter, completely surrounded by non-combustible and non-smoke or -odor producing material, either of natural rock, cement, brick, tile, or block, in a pit one (1) foot in the ground or more, on the ground, or on a raised bed, including permanent outdoor wood-burning fireplaces. Recreational fires shall be located a minimum of 25 feet from buildings, combustible materials, power lines, and property lines. Recreational fires may be used for pleasure, religious, ceremonial, cooking, or similar purposes. Mobile cooking devices such as manufactured hibachis, charcoal grills, wood smokers, and propane or natural gas grills are not defined as recreational fires." Pit shall be a maximum of three (3) feet in diameter. Pit shall be a minimum of one (1) foot deep. Pit shall be a minimum of twenty-five (25) feet from buildings, combustible materials, power lines, and property lines. Burn only charcoal or clean wood (no stained, painted, varnished, or chemically-treated wood). Leaves, grass, or other items that will produce excessive or noxious smoke shall NOT be burned. Flames shall be a maximum of three (3) feet above ground level. Person must be able to withstand heat within five (5) feet of pit. An adult MUST be present to supervise the fire until such fire has been extinguished. Water source for extinguishment must be available near pit. Before beginning any recreational burn, please notify the Police Department at (763) 424-5444 to inform them of a recreational burn. Each permit holder shall notify the city not less than twenty-four (24) hours prior to commencement of each recreational fire. Any burn may be halted at a police officer's discretion for violation of any regulation. Police may issue a citation, which could lead to a fine and a mandatory court appearance.